If you’ve not already completed a 20-mile training run, then it isn’t likely you’re up for a fall marathon. But, if you’re still in the selection mode regarding the big 26.2, here are a few reasons to choose the October 18 Metro Health Grand Rapids Marathon right here in river city. Lots of free parking. It is, after all, Sunday in downtown Grand Rapids and ArtPrize will be a distant memory. You can park in DASH lots all around the start/finish at the David D. Hunting YMCA. But you can’t park at the Y unless you belong to the Y. Your family and friends can see you off from three locations. A short loop in the area around the start will allow people to come cheer you on, not only at the very start but conveniently two more times within the first four miles of the race. This is great if you need to shed a shirt. A new downtown loop takes you into downtown Grand Rapids over the 6th Street Bridge and along the river. Always nice to gaze upon the familiar skyline of the city as you run. 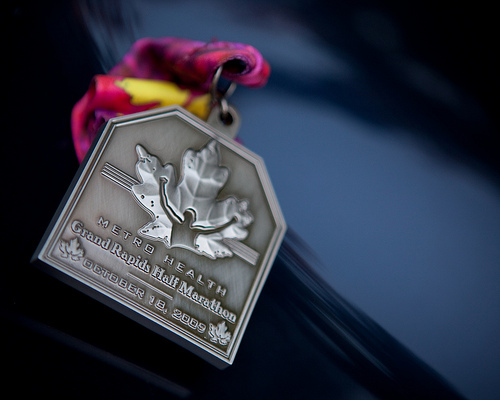 Running the Metro Health Grand Rapids Marathon is a great deal. West Michigan is less expensive than Chicago or Detroit. You don’t have to spend money on a hotel, gas, parking or meals. The entry fee of $104 (late registration after 9/30. Would have been $74 if you’d been prompt) still compared to $125 in Chicago or Detroit. For what you save by running local you can buy at least two new pairs of shoes. And the money stays local. If you do stay over in a hotel in town you can get a room at the JW Marriott for $173.00 (including taxes). There’s no JW Marriott in Chicago or Detroit. There will be one in Chicago next year, but for now it’s a Metro Health Grand Rapids Marathon exclusive. The Metro Health Grand Rapids Marathon is like a fall color tour without the car and not Up North. After the city run and the cheering crowds, you head out and along the Grand River to Millennium Park where the quiet and serenity of this 1500 acre park. “It’s like a run in the country,” said Don Kern, race director. If you are so inclined, this race is a Boston Marathon qualifying race, that is, it meets USATF Standards and is chip timed so if you do well you can repeat the 26.2 miles in Beantown in a coming year. Can’t run a whole marathon? If you are currently running 10 milers, you can do the half marathon, or if you can convince five friends who can run 5 miles or so each, you can build a relay team and enjoy the race that way. I joined the Metro Health Grand Rapids Marathon staff last year to learn about putting on a race and give back to the running community. After reading many great comments on http://www.marathonguide.com/, I contacted Don Kern to help with the events. I found out right away that I was working with some of the best people in the Grand Rapids community. Being a runner myself, I have learned a great deal for Don and his fabulous staff! It was even more exciting to me that the staff runs the race "unofficially" two weeks before the actual day. This Sunday, October 4th 2009 the staff will lace up to run the new 26.2 mile course. Our daughter will want to run for a while too, so I will not have a personal record for this race. She is training for the Bagel Beanery Kids Marathon, and hopes to "beat all the kids from last year." During our run this weekend, she will have many coloring-book breaks and iPod breaks. Family, friends, and 26.2 miles - a great way to spend a Sunday!